On Monday, I met up with Joan a fellow “container” garden enthusiast and a regular visitor to my blog. It was great to not only see all her wonderful pots of fruit, vegetables and flowers, ask numerous questions ranging from types of compost, worm farms to problems with insects, but also discuss our successes and failures. For example I discovered Joan’s zucchini suffered from the same problems as mine – once the flowers fall off the end of the baby zucchini wither and rot! Joan is a mine of useful information and after my latest setback with tomatoes, I suddenly felt inspired and re motivated! We could have happily chatted for a week and still not have covered everything! (Mr. Piglet, my chauffeur was happy, when he discovered her husband was a fellow football enthusiast). Another tidbit of information shared was the agricultural centre Sanipina where I could not only buy garden “potions” but also receive simple practical and knowledgeable advice in English! For anyone living in the Algarve here are the details. Delighted with the above recommendation dear Mr. Piglet kindly agreed to make a detour (without moaning) on the way home via the agricultural centre AND a garden centre. Luckily, before leaving home that morning I’d collected various samples of the bugs which had taken up residence on my plants and fruit trees. It’s always easier to show rather than try and explain to the “experts”. So not only did I get the pesky bugs identified and prescribed a suitable potion, I also bought a black fig tree which resides in a huge pot. Fingers crossed this one, unlike its predecessors would survive! Do these bugs look familiar? The assistant at Sanipina carefully inspected my bug specimens and pronounced they were all members of the cochonilha family because when you squished them they released a reddish liquid. I also learned this is where the colouring Cochineal originates from – I won’t be buying that again! I asked her if they were Mealybugs but she was not familiar with the name. I checked them both out on Wiki and they look the same to me, so I assume they are? Can any of my Portuguese followers help with this one, please? She recommended using a combination of two products for maximum effect. However, the advice came with lots of “ifs” and “buts” instructions. 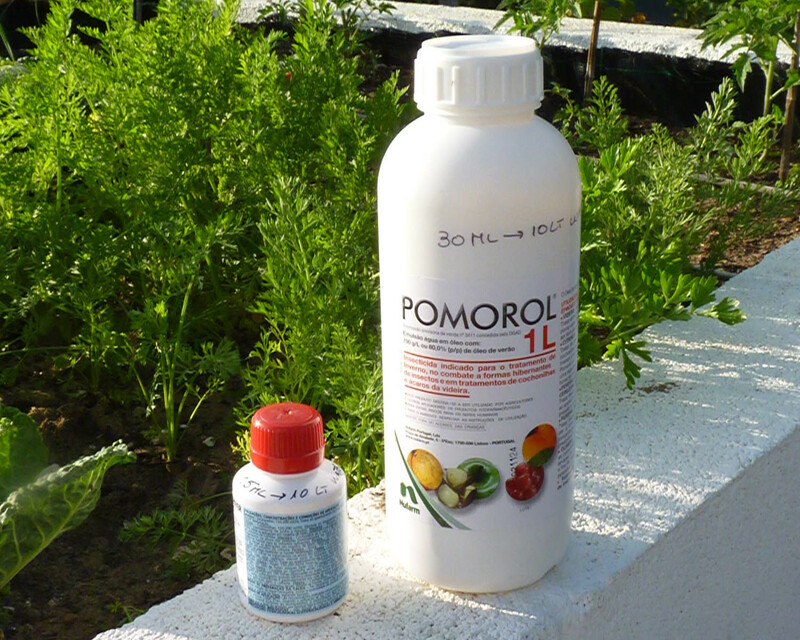 If trees are in flower or have fruit which are less than the size of a walnut do not use the Pomorol (see product in large pot). Use combination of both products, but do not eat the leaves for at least a month. The insecticide in the small pot also kills ants! Joan also suggested lots of natural remedies such as garlic, chilli, tobacco, rhubarb leaves etc plus Insecticidal Soap. I’m going to try these on some of my other plants to see how effective they are and will make another post later in the year with the results. In the meantime, if you have any suggestions or useful links, please leave in the comments below and I will add to the “useful links” below. It’s like you’re waging a war to keep your little plants alive and healthy. Good luck. My money is on you and i expect you’ll have a great harvest. Chubby you are so right – it is like waging war! I probably will have a great harvest, but even now I’ve just discovered another type of bug sucking away at my hibiscus! I will definitely not eat cochineal again! How gross! I have the same problem with my lemon and bay tree, the local garden centre gave me a recipe to mix up and use but I have not got to it yet. Will report back and share it if it works. Good luck optie, will be itneresting to see who wins – you who are the bugs! 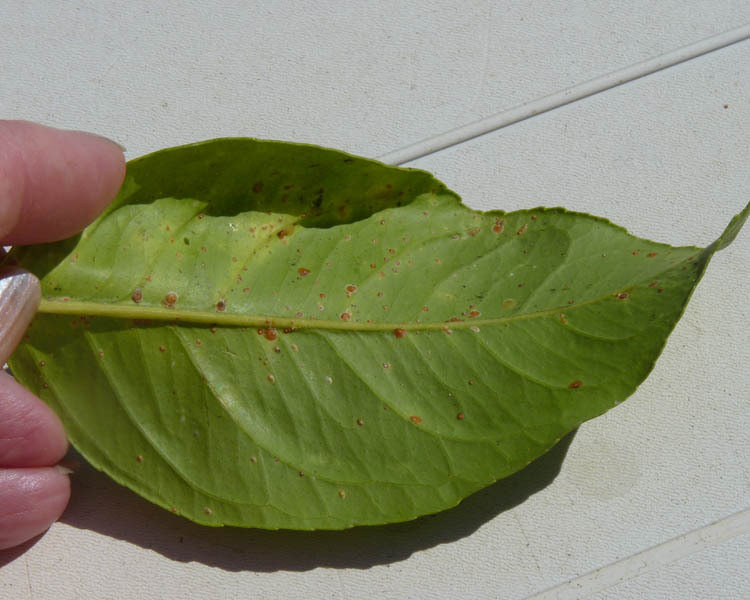 Hi Carole: your laurel sees to have mealybug; the citrus seems infected with scale. I’ve had both my lemon tree and fig tree infected with those last year. Because I prefer not to use chemicals I was given this recipe and it worked after 3 sprays. I think with the scale the ants are to blame, I was told! You can treat both ecologically with a spray made out of 1 cup alcohol, 2 tablespoons dishwashing liquid, 2 tablespoons cooking oil, 3,5 litres water. Spray all over; both sides of leaves; and repeat 2 or 3 days later. I hope this insecticide treatment will be kill the bugs. As chubby says above, it’s like a war! Use the one you can buy at the chemist (rubbing alcohol). LOL 🙂 OK. Are you in Portugal yet? I don’t know if either one of these are in your region, but I thought I’d mention them anyway. Checked both Hollyhock Rust and wooly APhids and it’s not those. 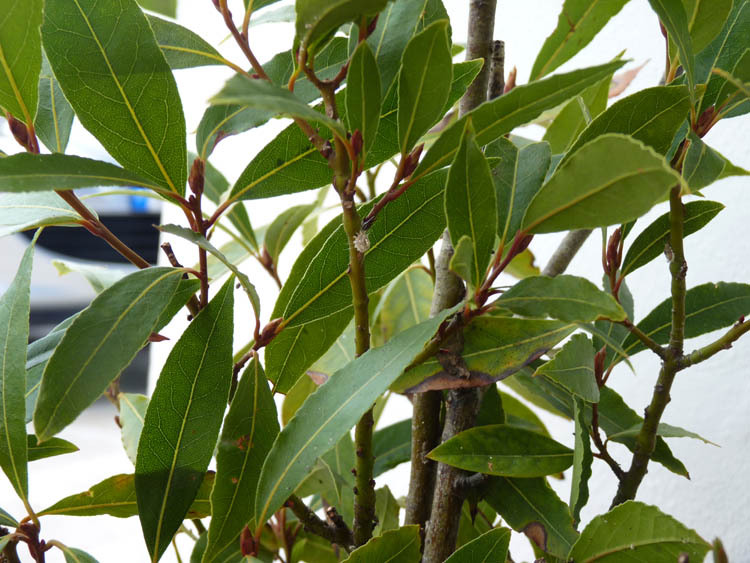 However, I think one of myo ther plants may have WA. I will look more closely tomrrow. The Mosquitos are out biting now at dusck! Looking at those lemons makes me wonder how many bugs I have eaten!!! Me to! I ignored this for sometime and it’s only now I’ve realsied a couple of the branches are beginning to die, because they are infested with these bugs! 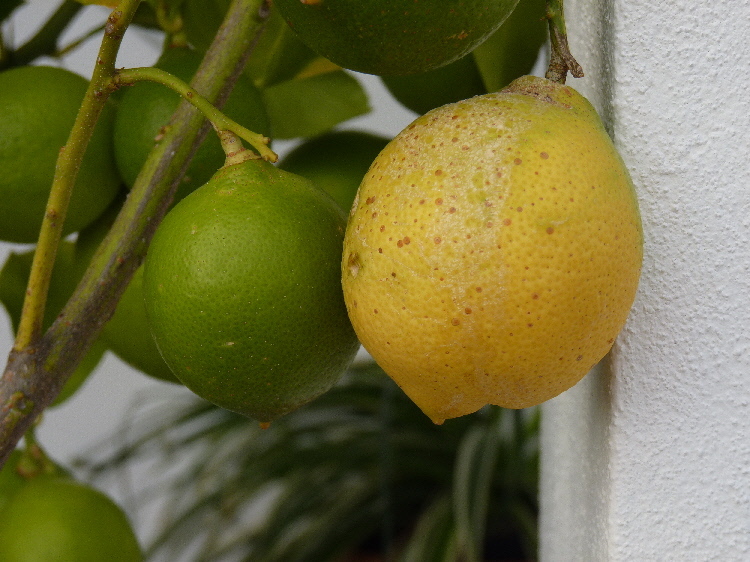 Oh, to have a lemon tree! I wonder if they can be grown in pots and carried indoors in freezing temps. I would love to have a few of those scattered about. I hope you can get rid of these pests, it seems once they get a hold they are not easy to get rid off, best of luck. Thanks Mags, I’ve been negligent in the past and they’ve made themselves at home here! I also like natural remedies for our health. Hi Cocomino, what type of things do you grow? I have some Aloe Vera plants which are very good when the sap is applied to sunburn etc I don’t make any of the drinks for digestion though as I’m a little wary. I am going to try some of the natural remedies on my garden. I’m thinking to grow garlic, basil and chive. They are easy to grow. I hope you try the more natural “recipes” suggested by other commentors…less chemicals sounds better to met! Hi Flower pot, yes I’m going to try the more natural remedies, but the infestestations were so bad on some of the plants, pefore I noticed, I needed to take drastic action. There is one I am going to try with chilli and garlic. Hello PiP, I have have been surfing the net to find out more about these pesky creatures. There seems to be a quite a variety of mealy bugs. looks like the ones you have found are the monsters. 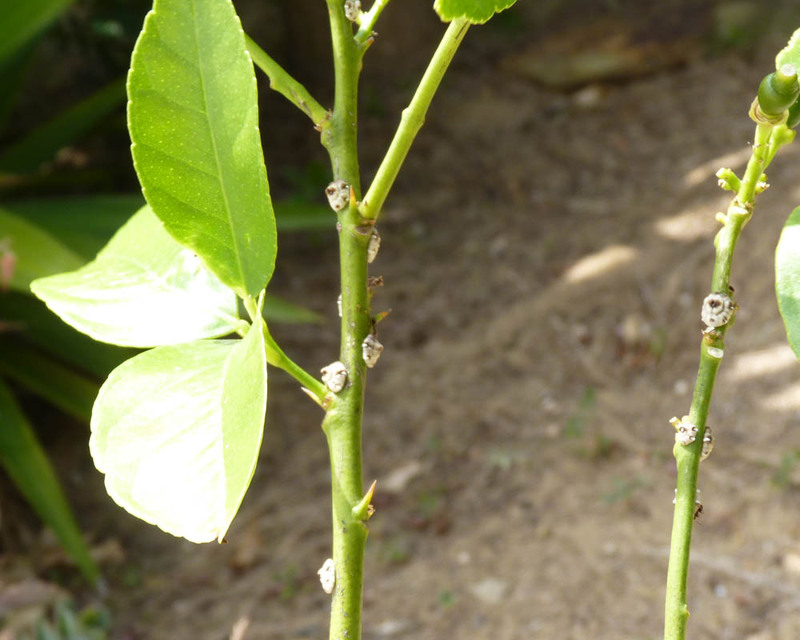 There are even mealy bugs specific to citrus trees. The ones I have come across have been eradicated with white spirit or methylated spirit but those cochonilhas in your garden are more difficult. I have read that products containing fatty acids (whatever they are) are needed for the more challenging bugs. The best of luck. I am sure you will overcome this latest test to your green fingers. Best of luck…hope the solutions are a solution to the problems! I remember one year when our blueberry bushes (100 of them) had an infestation of some beetle…I paid my 3 children and the 3 neighbor kids a penny a bug…and gave each a cup half-filled with soapy water…and set them loose in the garden. What fun they had knocking the bugs off the leaves into a watery grave…then I went around, spraying the leaves with a soap solution. Hi vivan, someone suggested disinfectant soap. I love the idea of setting the kids loose in the garden on the bugs what an excellent solution. 100 bushes WOW! Yes, bugs (and little boys) don’t like soap, I guess. 🙂 The 100 blueberry bushes were amazing…the entire “backyard” was like a paradise…it sloped down and when you were in it, you felt like you were in a wilderness. 🙂 I cried when we had to move. I would have cried, also! Do you guys have them? Hey I’m first in the Wuss queue! I’ve also started bookmarking pest pages…but reading about them before I go to bed gives me nightmares! Did the effort succeed… I know I’m late to the table but how did it go?